Atlantic City Blackjack was first introduced in 1976 when gambling was legalised in the resort town in in a bid to revive the city. Prior to that time, Las Vegas was the main destination for gaming in North America and the Atlantic City casinos knew that they had to tweak their version of Blackjack so that it offered something special, something that Vegas couldn’t match. The hometown version of Blackjack proved to be the solution and so the exciting version of American Blackjack (or Hole Card Blackjack) was born. What is Atlantic City Blackjack? Atlantic City Blackjack is described as a Hole Card game which means that the Dealer is dealt two cards, one face up and the other card face down. It is the face down card that is classed as the Hole Card. The Dealer will always check his Hole Card if his other card is a Ten valued card (a 10, Jack, Queen or King) or an Ace. There are two major differences between Atlantic City Blackjack and regular Blackjack, the first being that Atlantic City Blackjack uses 8 standard decks instead of the conventional standard 6. What this means is that the odds are tipped slightly in favour of the Dealer, as Busting is less frequent with more decks. As a result, the Dealers who must Hit on hands under 17 are less likely to go over 21. Very clever work on behalf of the casinos to get the upper hand, but wait till you read about the second feature. 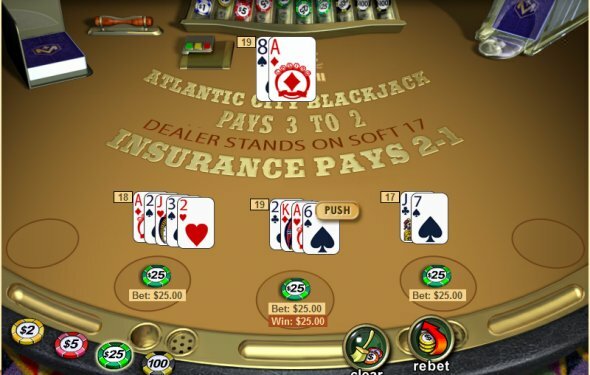 The second difference in Atlantic City Blackjack once again changes the odds but this time in favour of the player; the Late Surrender option allows the dealer to check for Blackjack when they have an Ace or a Ten valued card and if they don’t have it, the player has the option to give up their hand – in other words not playing the hand in return for half of their stake for fear of losing the possible strong hand the Dealer might have – a pretty neat idea if you ask us. A key point to remember is that the dealer will always Stand when his hand is 17 or greater. Players are permitted to Double Down on any two cards and can even Double Down after a split. For those players who want to play a large number of hands, up to three splits are allowed which results in a total of 4 hands. If the player is dealt two Aces they are allowed to split them once only with only one card dealt on top of that Ace. It is also important to remember that when you split an Ace pair and the one card dealt on top of that Ace is a Ten valued card, the result is 21 and not a Blackjack, nor is split 10 cards receiving Aces for that matter. For those in the know, the rules stands that if you’re fortunate enough to be dealt with a pair of Aces you should always, repeat always Split them. The other rule of thumb is that you should always Stand when you have a pair of tens, don’t split them. Keep in mind that the variant has a good payout (2:1) and a low house edge 0.36%, which is great for the benefit of Atlantic City Blackjack players. Payouts are paid out at odds of 3-2 should you win the game with a Blackjack, or any other standard win gets you an even real money (1-1) payout.